The name Matthew is derived from the Hebrew Mattija, being shortened to Mattai in post-Biblical Hebrew. In Greek it is sometimes spelled Maththaios, BD, and sometimes Matthaios, CEKL, but grammarians do not agree as to which of the two spellings is the original. Matthew is spoken of five times in the New Testament; first in Matthew 9:9, when called by Jesus to follow Him, and then four times in the list of the Apostles, where he is mentioned in the seventh (Luke 6:15, and Mark 3:18), and again in the eighth place (Matthew 10:3, and Acts 1:13). The man designated in Matthew 9:9, as "sitting in the custom house", and "named Matthew" is the same as Levi, recorded in Mark 2:14, and Luke 5:27, as "sitting at the receipt of custom". The account in the three Synoptics is identical, the vocation of Matthew-Levi being alluded to in the same terms. Hence Levi was the original name of the man who was subsequently called Matthew; the Maththaios legomenos of Matthew 9:9, would indicate this. The fact of one man having two names is of frequent occurrence among the Jews. It is true that the same person usually bears a Hebrew name such as "Shaoul" and a Greek name, Paulos. However, we have also examples of individuals with two Hebrew names as, for instance, Joseph-Caiaphas, Simon-Cephas, etc. It is probable that Mattija, "gift of Iaveh", was the name conferred upon the tax-gatherer by Jesus Christ when He called him to the Apostolate, and by it he was thenceforth known among his Christian brethren, Levi being his original name. Matthew, the son of Alpheus (Mark 2:14) was a Galilean, although Eusebius informs us that he was a Syrian. As tax-gatherer at Capharnaum, he collected custom duties for Herod Antipas, and, although a Jew, was despised by the Pharisees, who hated all publicans. When summoned by Jesus, Matthew arose and followed Him and tendered Him a feast in his house, where tax-gatherers and sinners sat at table with Christ and His disciples. This drew forth a protest from the Pharisees whom Jesus rebuked in these consoling words: "I came not to call the just, but sinners". No further allusion is made to Matthew in the Gospels, except in the list of the Apostles. As a disciple and an Apostle he thenceforth followed Christ, accompanying Him up to the time of His Passion and, in Galilee, was one of the witnesses of His Resurrection. He was also amongst the Apostles who were present at the Ascension, and afterwards withdrew to an upper chamber, in Jerusalem, praying in union with Mary, the Mother of Jesus, and with his brethren (Acts 1:10 and 1:14). Of Matthew's subsequent career we have only inaccurate or legendary data. St. Irenæus tells us that Matthew preached the Gospel among the Hebrews, St. Clement of Alexandria claiming that he did this for fifteen years, and Eusebius maintains that, before going into other countries, he gave them his Gospel in the mother tongue. Ancient writers are not as one as to the countries evangelized by Matthew, but almost all mention Ethiopia to the south of the Caspian Sea (not Ethiopia in Africa), and some Persia and the kingdom of the Parthians, Macedonia, and Syria. According to Heracleon, who is quoted by Clement of Alexandria, Matthew did not die a martyr, but this opinion conflicts with all other ancient testimony. Let us add, however, that the account of his martyrdom in the apocryphal Greek writings entitled "Martyrium S. Matthæi in Ponto" and published by Bonnet, "Acta apostolorum apocrypha" (Leipzig, 1898), is absolutely devoid of historic value. Lipsius holds that this "Martyrium S. Matthæi", which contains traces of Gnosticism, must have been published in the third century. There is a disagreement as to the place of St. Matthew's martyrdom and the kind of torture inflicted on him, therefore it is not known whether he was burned, stoned, or beheaded. The Roman Martyrology simply says: "S. Matthæi, qui in Æthiopia prædicans martyrium passus est". 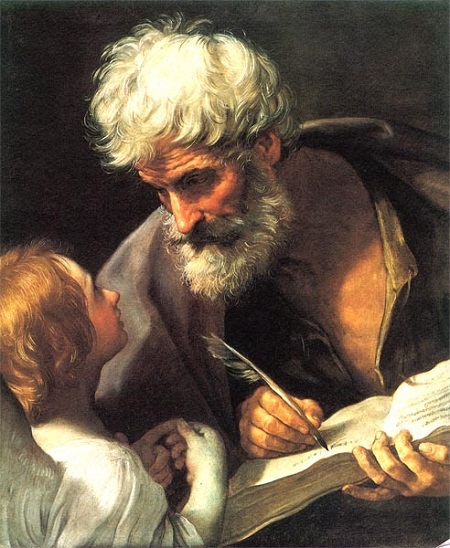 Various writings that are now considered apocryphal, have been attributed to St. Matthew. In the "Evangelia apocrypha" (Leipzig, 1876), Tischendorf reproduced a Latin document entitled: "De Ortu beatæ Mariæ et infantia Salvatoris", supposedly written in Hebrew by St. Matthew the Evangelist, and translated into Latin by Jerome, the priest. It is an abridged adaptation of the "Protoevangelium" of St. James, which was a Greek apocryphal of the second century. This pseudo-Matthew dates from the middle or the end of the sixth century. The Latin Church celebrates the feast of St. Matthew on 21 September, and the Greek Church on 16 November. St. Matthew is represented under the symbol of a winged man, carrying in his hand a lance as a characteristic emblem.